during the NBA All-Star Game 2018 at Staples Center on February 18, 2018 in Los Angeles, California. 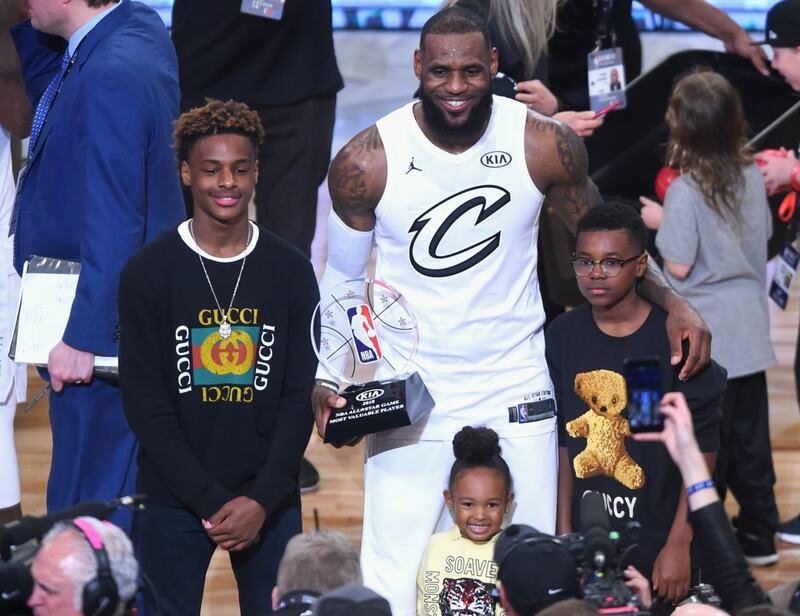 On Monday, LeBron James Jr. made his dad proud when he stepped onto the court for his first game for Santa Monica Crossroads’ eighth-grade basketball team, wearing the number 23, ESPN reports. “I don’t know how long it’s going to last, but it definitely made me feel proud,” the proud dad said on Tuesday after practicing with the Lakers. His son had switched from his number “0” which was a homage to Russell Westbrook that he wore on his team jersey while playing on the AAU circuit. Now he’s honoring his dad with his Los Angeles Lakers jersey number. And to make it all the sweeter, Bronny’s team won over Culver City Middle School on Monday. James is also proud that Bronny and the rest of his kids are getting acclimated to LA, especially since it was new surroundings and it had to be a family decision. “It was kind of nervous for all of us because it’s the beginning, it’s the start,” James said. Watching his children succeed seems to be James’ greatest gift.